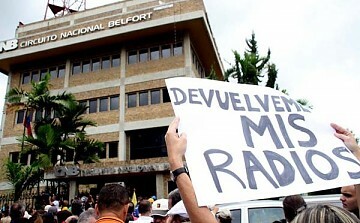 More than five and a half years ago, the Venezuelan telecoms regulatory agency (CONATEL) ordered the shutdown of 32 radio stations, including five belonging to the private network CNB (Circuito Nacional Belfort). Those CNB stations eventually became part of the State Media System (the main one in Caracas is now ANRadio, the National Assembly’s FM). All that’s left of CNB is the station they run in Merida (95.3 FM). It doesn’t hide that it’s reduced any polemical content in order to avoid troubles. What the RCTV Case was in 2007 for our TV broadcasting, Conatel’s move against CNB was for our radio. This really matters as radio is a main source of news for a huge number of Venezuelans. And the moves against radio stations across the country have not stopped, as this new report by NGO Instituto Prensa y Sociedad (IPYS) shows. Published by Armando.Info, goes into detail on how the radio landscape has drastically changed in places like Carabobo, Monagas, Barinas and Amazonas (a case that I wrote about in an earlier post). In those States, radio is probably the most important way for people to get local information and the hegemony’s slow-but-steady approach to controlling it has worked: The frequencies end up either in the State’s direct or indirect hands (“community radio”) or go to private owners who prefer to minimize any news and opinion programs that could get them in trouble. For example, a local broadcaster says that 95% of all radio stations in Monagas State are either with the hegemony or chose self-censorship. In Amazonas State, half of the radio stations are State-owned and the private ones left toned down their opinion content, to the point that Governor Liborio Guarulla admits he censors himself on his radio show. Still, official numbers indicate that there are more private radio stations than public ones (community ones are not classified as public, even if most of them are closely related with the State). The central government likes to use that data to promote their defense: The hegemony is from the private sector and the State is just defending itself. But behind that argument lies the fact that many of those private owners simply chose to stay quiet in order to survive.